I'm not a high end collector.. I like the bargain stuff. That said.. I'm looking to shake things up, literally. What's the best bang for buck pin that includes a shaker motor? Thx! TFTC is a cheap, pretty good game with a shaker. Tales from the crypt or road show. I haven't been following current price trends, but as of a year or two ago my answer would be Jurassic Park. Gladiators has an awesome shaker, can be picked up for around a grand, and has pretty fun gameplay. +1 for Gladiators being cheap. Problem though is that they're not terribly common, and the theme is polarizing. I picked up my Earthshaker for $1,700. I thought that was a fair price. Playfield was perfect, but the cabinet art was blown out. You'll have a better chance finding one of these, and the theme is probably the best use of the shaker. whaaaaat Gladiators will be the cheapest and it is a DMD. should be priced just below the Earthshaker. Also Checkpoint has a shaker motor, keystart and first dmd! Buyer beware, many gladiators have had the shaker pulled out. I've had 2 gladiators and only 1 had the shaker... Adding the shaker in after, is pretty much non existent. I've looked around and asked, no such way. You'd have to custom build a harness or wiring for it. Been putting off listing my JP because I need to get some switch issues fixed. When it is running smooth I will be listing it at $2k. Just throwin that out there. Baywatch is awesome with a shaker. As others have said, Gladiators is your easy choice. I'm selling mine to a friend as her first game at 1k. Find me a DMD game with a shaker at a better value and I'll eat me hat. +1 to Last Action Hero. Yeah, Gladiators without a shaker just wouldn't be the same. Anyone ever add a shaker to NASCAR?? Lots of DE games. TFTC, JP, Royal Rumble. TFTC is probably the best one. TFTC cheap?? really...? that pin just keeps going up. I remember it being a $1000-$1500 pin.. call that cheap if you will... but I see them consistently for $2500-$2800... I am not sure of OHMI's budget but that is starting to not be cheap anymore. GREAT GAME THOUGH... I miss the 2 I use to have. Want it back, but yeah with the nearing $3K I may just catalogue TFTC as "great game I use to have"
The gladiators shaker is @#$@%@#% x4 the red tremor from cointaker. Roadshow is the best use of a shaker IMO. Plus you get 2 human heads. I think they can still be found around $2000. A guy I know sold his not that long ago for <$2000. Might be a stupid question, but what does a shaker accomplish or do? I've never played a game with one, so I'm in the dark here as to why I might want to entertain the idea of one. 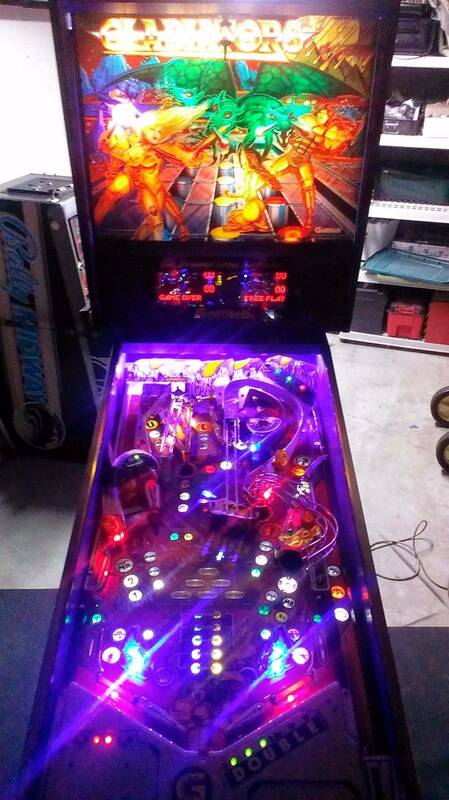 I have good news for you if you want to pick up a Gladiators in the St. Louis area.My friend is getting ready to sell his,he has had it for about 2 years and he bought it from me.It plays great!